Walking away from the MACUSA sets featured heavily in Fantastic Beasts and Where to Find Them, SnitchSeeker and a group and online reporters situated ourselves in a room to await interviews with the main cast of the series, including Eddie Redmayne, Katherine Waterston, Alison Sudol, Dan Fogler, Colin Farrell and Ezra Miller. 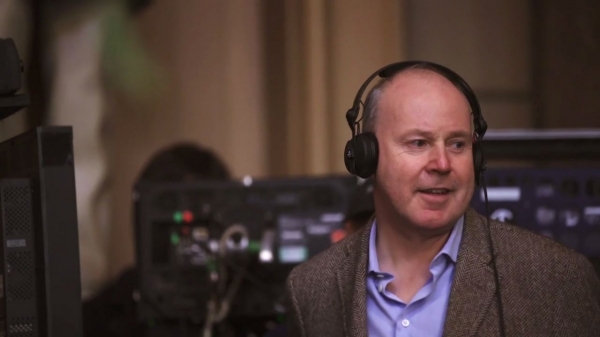 We also chatted with director David Yates (a wealth of spoiler-filled knowledge) and producer David Heyman. Thus began our many hours-long interrogation of the cast and crew of the feature at Leavesden Studios back in December. For those interested in reading about the MACUSA sets and various aspects of the creation of the 1926 NYC wizarding world, head back to our set visit report focusing on the various locations and props set up for Fantastic Beasts, right here. Director David Yates took a few minutes from directing a day scene between Graves (Colin Farrell) and Credence (Ezra Miller) to chat with us a bit about the film in the promos room. As always with Yates, there’s a calm yet keen energy emitting from him when he talks about all things Harry Potter and Wizarding World. • Yates said “it was a bit of a no-brainer” coming back to direct the latest installments in J.K. Rowling’s world, given the team he’s always worked with during the Harry Potter series, plus the script itself (that he first read in May 2014), which he called “charming, moving and tender.” He also found creating a brand-new world “liberating” compared to the Harry Potter films, as fans would not be coming in with years of preconceived ideas of the characters and plots. • There was months of back and forth with the final draft of the Fantastic Beasts screenplay between J.K. Rowling and Yates (with his team), and as the author was new to the world of screenwriting, it was a learning process for her, and one Yates was happy to assist with. Yates commended Rowling for sending over new drafts of the script up to a week after he returned one with new notes, something that is not of the norm, he said. • Yates even teased that some of the scenes and ideas cut from the drafts could show up in one of the future Fantastic Beasts sequels. 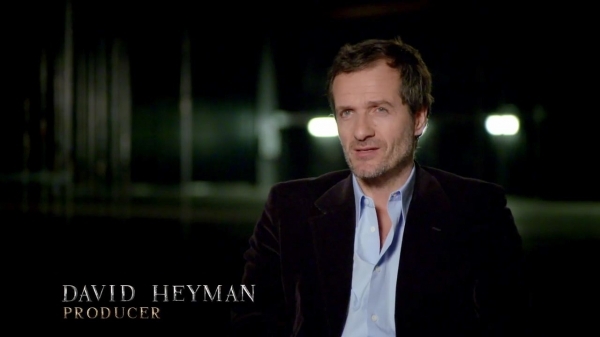 • Yates mentions that there’s a character in this Fantastic Beasts movie whose magic is repressed, but would not name names. Given one of the promos we spotted, of Graves whispering something to a worried-looking Credence Barebone (similar to this shot), it was safe to conclude that this character in question is the mysterious young Mr. Barebone. The magic within this character eventually explodes during the movie, with the assistance of someone else influencing/manipulating them (presumably Graves again), and from that explosion of power and magic comes anarchy and war. Then we began the round of cast interviews. First, after a long wait, entered Eddie Redmayne. He was filming a second unit night scene later that day involving a baboon (added after through CGI), alongside co-stars Dan Fogler (dressed head to toe as Jacob when we speak to him), and Alison Sudol (her blonde wig under a hairnet as she’s half-dressed for the shoot). Katherine had the day off but was still kind enough to come in and speak to us. We meet Colin and Ezra after they’d finished filming earlier that day, and removed their costumes (unfortunately). 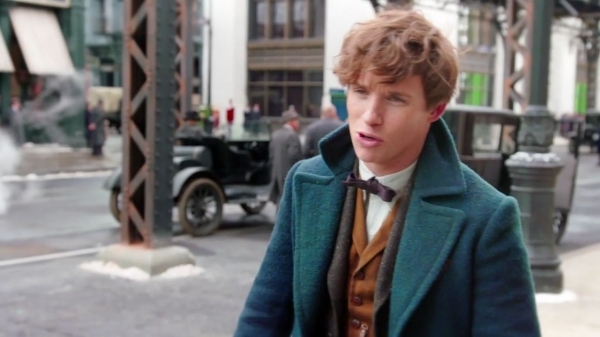 Eddie Redmayne is a vision as Newt Scamander as he traipsed into our waiting room. Dressed head to toe as Newt, he flourished across the room in that big peacock-colored greatcoat, brown clothes, curled hair (and a cup of Starbucks, but that’s neither here nor there). He was holding Newt’s wand (he wouldn’t tell us the core), which he showed off to us, and then passed around for the group to touch and examine. It’s a light-brown color, very thin and with a hollowed-shell shape at the end of it. We now have to wonder how Newt got his hand on a wand in the first place since he was expelled from Hogwarts, and students generally have their wands snapped in half and taken from them (just ask poor Hagrid). He was just as energetic and happy to chat as you’ve seen him in the many interviews he’s done in the past, and it was pretty infectious. • Before Newt got to New York City, Eddie explains, he had been in the field studying and cultivating magical creatures for about year. • Eddie breaks down how Newt meets Tina, Queenie and Jacob. Newt bumps into Tina, a demoted American Auror (who is very by-the-book and looking to prove herself after losing her job). The Goldstein sisters are now working in the wand permit office at MACUSA, Eddie reveals, when the first movie takes place. He describes Queenie’s desk as slightly chaotic, with makeup all around, while Tina’s is completely organized to a T.
• Eddie described Jacob as the eyes of the audience in the feature because he’s pulled into the wizarding world, and in complete awe, and desperately never wants to go back into the No-Maj/Muggle world ever again. Katherine Waterston, dressed head to toe in black, was as reluctant to reveal too much information as Ezra Miller would be later on. It’s obvious they’re both desperate to spill about everything to do with the movie, but afraid of spoiling too much. As she grabbed a seat with us, she was handed her rather heavy, dark-brown wood wand, and banged it on the table with a pretty heavy thud. She deliberately chose this sturdy, hefty wand, which reflects Tina’s austere, reserved personality. We turned to Alison Sudol, half-prepped to begin night shoots, and a lot more eager to talk about Queenie and Tina’s relationship. Like Harry Potter before them, the sisters are orphans, whose parents died when they were young. The two sisters raised each other, and Queenie does regard Tina as a mix of sister and mother as a result. 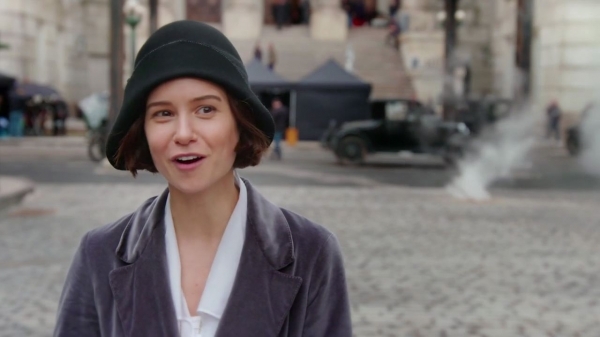 • Alison recalled her first meeting with Katherine Waterston, during her audition for Queenie. Katherine, who was cast after auditions with Eddie Redmayne, had gotten the role by then. So, there were a lot of, sort of, putting us in different situations and matching up different actors with each other,” Sudol said. • New York City (at the time) did not house a lot of magical creatures, said Alison, so when Newt shows up with his enchanted suitcase and all beasts let loose, it’s “like this sense of wonderment, of a kid going to the zoo for the first time.” Alison, and undoubtedly the others around Newt, found them extraordinary and fascinating. 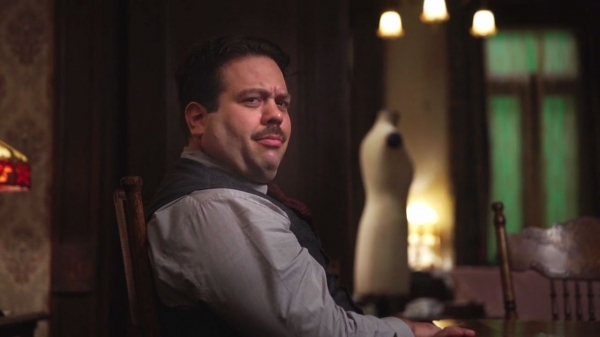 The last of the quartet (and the last interview of the long and joyous day) was with Dan Fogler. He was dressed as Jacob for the baboon-related night scene, and we spotted a bite mark on his neck immediately. Dan was jovial and happy to talk, and his enthusiasm to be part of the series was ever-clear. Dan was also a pleasantly unexpected wealth of information about the movie’s setup. • Jacob’s back from World War I, so as a war veteran he’s “seen some monsters, he’s seen some chaos,” said Dan, and as such is pretty desensitized to violence. However, he, like Ron Weasley before him, is ever the loyal sidekick and best friend. He comes back from the war, works as a baker who lives in poverty, and is alone, doesn’t have anyone, and then finds himself in this “motley crew of a family,” with new friends Newt, Tina, and especially Queenie. • He talks about Jacob’s man-of-the-streets knowledge meshing well with Newt’s cerebral and fish-out-of-water situation once he gets to New York, and how there is a balance between the two. Jacob, of course brings the comedy relief, but there is a lot of heart. He falls in love with the wizarding world, but as he states, Jacob can’t stay (he wouldn’t say why), and according to Dan, “it’s really quite heartbreaking.” He likened Jacob’s story to that of the sad clown archetype. • Jacob becomes most attached to the white-haired demiguise, Dan admits, despite it being “hard to catch because it can tell the future.” Something about Jacob’s nonthreatening nature lures to demiguise to trust him and they grow a bond, which helps them in tight and dangerous situations. • Dan talks about a scene where a magical creature shaped as an elephant/rhino is in heat, and apparently the team is trying to coax it back into its enclosure with hormone musk … which gets spilled all over Jacob. The scene then involves Jacob, now drenched in musk, running for his life away from the beast, which is eager to have its way with him. • Dan says flat out that “it’s love at first sight” when he sees Queenie for the first time, but does mention, due to the political climate in the American wizarding world, the two could not be together. 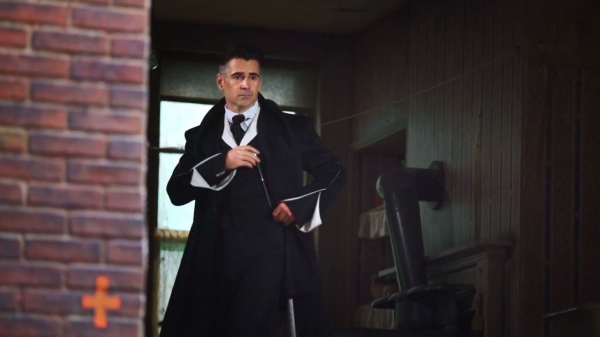 When Colin Farrell walks in, he’s out of costume, but carrying Graves’ black wand (similar to the one Narcissa Malfoy wields in the Harry Potter films). Colin was rocking some white/grey streaks on the sides of his hair, near his ears, and that zis deliberate for Graves’ character (and not his own). Colin reveals that David Yates called him up a couple of months before production began to take on the role of the head Auror at MACUSA, and who was he to say no to such a great offer? The two spoke 3-4 times prior to Colin accepting the role, about Graves’ character and the script. • In addition to being head Auror, Graves (a very powerful and naturally skilled wizard) is the chief security officer for the protection of wizards for MACUSA, and is the right-hand man of President Picquery (Carmen Ejogo). Colin goes into great detail about his involvement, how it tears apart the wizard-unfriendly No-Maj environment, and how Newt plays into all this: “We're investigating what is going on in New York. New York is kind of being turned on its head and there is this statute of secrecy whereby the No-Majes, who are the American equivalent of Muggles,” Colin said. • Colin vaguely discussed the scene he filmed that day, saying that Graves was in a point where he was taking charge and control of a situation, or at least trying to feel like he was getting close to resolving or exposing what the issue would be. Given that Ezra Miller’s Credence was involved, it may have to do with his wizarding explosion. • Colin revealed that Graves knows Newt through his brother, Theseus, who is a very powerful and commanding British Auror. We finished off with Ezra Miller, and like we said, he stayed pretty mum about Credence and the film’s plots, but went on enthusiastically about being a part of the Wizarding World. That’s it for now. We’ll see the finished product this November in theaters and IMAX, and hopefully it will be well worth the wait.